As a creative force, student of the human heart and soul, and champion of living the life you want, Oprah Winfrey stands alone. Over the years, she has made history with a legendary talk show - the highest-rated program of its kind, launched her own television network, become the nation's only African-American billionaire, and been awarded both an honorary degree by Harvard University and the Presidential Medal of Freedom. From all her experiences, she has gleaned life lessons—which, for fourteen years, she's shared in O, The Oprah Magazine's widely popular "What I Know For Sure" column, a monthly source of inspiration and revelation. 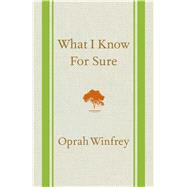 Now, for the first time, these thoughtful gems have been revised, updated, and collected in What I Know For Sure, a beautiful cloth bound book with a ribbon marker, packed with insight and revelation from Oprah Winfrey. Organized by theme—joy, resilience, connection, gratitude, possibility, awe, clarity, and power—these essays offer a rare, powerful and intimate glimpse into the heart and mind of one of the world's most extraordinary women—while providing readers a guide to becoming their best selves. Candid, moving, exhilarating, uplifting, and frequently humorous, the words Oprah shares in What I Know For Sure shimmer with the sort of truth that readers will turn to again and again.